Coordinator to you and your ship. His sights are set on accelerating the Southwest Marine repair team into action and coordinating all of the elements to assure a ready ship on time and on budget. We have three yards on the west coast to serve you. Each location provides total service capability including full shop services. Southwest Marine has dry docks up to 45,000 DWT, pier service up to 1500' and mobile gantry cranes with up to 65 ton capacity. Name our unigue "we'll come to you" and our "ride along" services, meaning we can perform most of our yard services at your site or we can work on ship while at sea. Our experienced and dedicated team has solved every conceivable repair problem and has designed and delivered thousands of unusual modernization projects. So whatever unigue or normal situations you may have, the Southwest team has probably done it before. Sales and Marketing, A1 Shapiro, at (619) 238-1000 today. and indepth yard brochures. 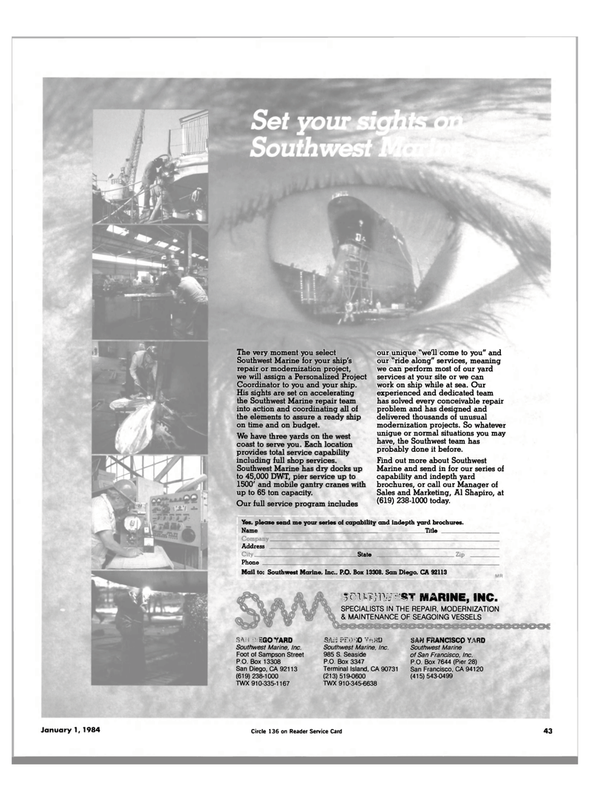 Southwest Marine of San Francisco, Inc.